"The Green Ones favored me this day." Thus begins A Taste of Magic, the latest magical world creation by Andre Norton. Wisteria is magically attuned to the world around her. Her senses relish the tastes of magic that the wonders of nature offer. But the peacefulness of her backwoods existence is shattered when her village is attacked by the raiding force of the bellicose Lord Purvis, who leaves only this twenty-something magic wielder and an adolescent lass as the inadvertent survivors. Wisteria has pledged herself to a mission. Now she and her young ward must brave the wilds beyond their home in pursuit of the ravager who destroyed everyone near and dear to their hearts. The woman with the Taste of Magic now has a taste for vengeance, and the blood oath she has pledged must be satisfied with the life of Lord Purvis. 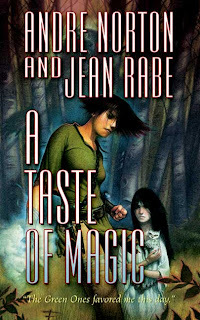 Source: Info in the About A Taste Of Magic was taken from the publisher's site at http://us.macmillan.com/book.aspx?name=atasteofmagic on 17/10/10. I like the twisty plot which surprised me again and again. The story telling quality was not very compelling and I had to force myself to trudge across a couple of patches. But once through it, the paced picked up again. Although this is book 5 in the Five Senses series, this book can be read on its own. I haven't read the other 4 books in the series, yet, I understood it just fine. There is enough info between the pages that a reader don't get lost. However if you've read the previous books, it would probably give you a better understanding of events and characters. I didn't like the gory scenes. Although the authors sort of glossed over it, it was still too gory for me. Because of that, this book is not for kids! O it would probably be too gory for me. Great review. I like the manner in which you breakdown reviews including things like character development. Good job.